It’s impossible to over-emphasize the importance of localizing food systems, homesteading, organic farming, community building and permaculture. So much time and so many resources are being spent fighting against something. Pick a cause and there’ll be placards, shouted chants, shared posts, too many marches, far too many speeches, ever more hand-wringing and much angst-ridden argument. As essential as all these activities may seem, we won’t find the urgent solutions we seek, and need, in what we’re fighting against. Solutions will only be found in what we celebrate. That’s only logical or perhaps “eco-logical” is a better word. The route to real change (long overdue) is not in the extreme growth economy or wresting back the power – and greedy lifestyles – from the tiny, highly organized minority who have grabbed it, stole it and otherwise usurped it from the vast majority of us, for whom ‘the system’ no longer works. The real power is on the ground, in the soil, in the sun and water and in the hearts, minds and hands of the disenfranchised 90+%. Since 2013, every May, a crew of musicians, farmers, filmmakers, writers and photographers have set off on a month-long Sea to Seed Tour, a sailing adventure through the Gulf Islands and Salish Sea, which includes, of course, Vancouver and Victoria. The goal is to promote a culture of resilient, localized food systems through music, feasts and story-telling, and to create lots of ripples. And to spread seeds too, widely and joyfully. That describes the mission of “Over Grow the System’s” Sea to Seed Tour: to connect farming communities, sown, nurtured and growing along the coast. 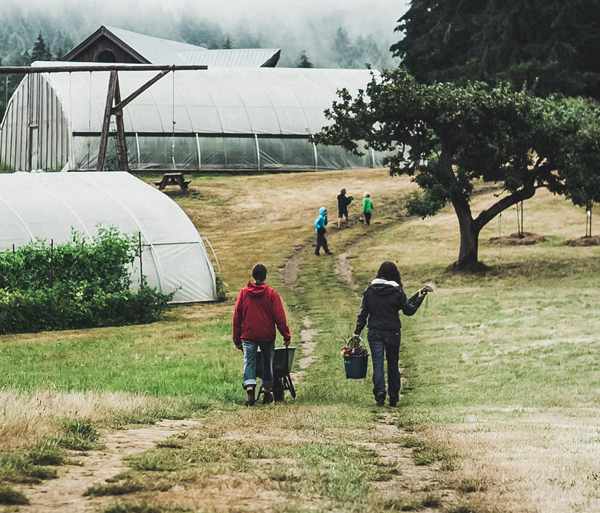 It’s impossible to over-emphasize the importance of localizing food systems, homesteading, organic farming, community building and permaculture, or engaging art and culture in supporting these wonderful initiatives. The music, farm-to-table feasts, educational forums and story-telling are creating positive change, rooted in the fertile soil of generative celebration, and cultivating a way of living with integrity. Rising Appalachia has toured Europe, the Caribbean, Central America, the Indian subcontinent, US and Canada “to help the environment, change the ‘mal-distribution’ of wealth and to simply make the world better.” Their Slow Music movement, inspired by the Slow Food movement, utilizes ‘non-industry methods,’ such as linking communities, pursuing alternative venues, supporting local businesses and non-profits and exploring transportation alternatives, including trains, bikes, low-impact vehicles, boats, horses and now: sailboats. In partnership with “Over Grow the System” are companies like Guayaki Yerba Mate and internationally-touring musicians. Joining the slow-travel, small-scale-living adventure are Dustin Thomas, Peia Bird and Tarran the Tailor. Visit www.overgrowthesystem.org for more information about the Sea to Seed Tour, including a wealth of inspiring videos and a cornucopia of food for thought and activity. Our greatest challenges are not global warming, resource depletion, politics, pollution or financial shocks, all symptoms of a system that is neither sustainable, nor fair. Our greatest challenge is our lack of connection with nature and with each other – a disconnection that has spawned an insatiable, ubiquitous greed. “Over Grow the System” offers a life-affirming, alternative model. Be part of the evolution and support the Sea to Seed Tour.